One of the most common clichés about libraries (you can find more in our blog for Halloween) is of a room full of people, in silence, focusing on the book they are reading. All about individual knowledge, rather than working together. And as with our Halloween blog, it’s also worth questioning this cliché, as it is one that does not tell the story of the importance of libraries in building up a sense of social and civic engagement. This is an important role. The concept of social capital – the resources and values that make groups work well together is well established. The OECD, through its Society at a Glance, has sought to measure this, and regularly shows the connection between a sense of belonging and trust in the community – and a feeling that you can influence decisions about you – and other positive results. 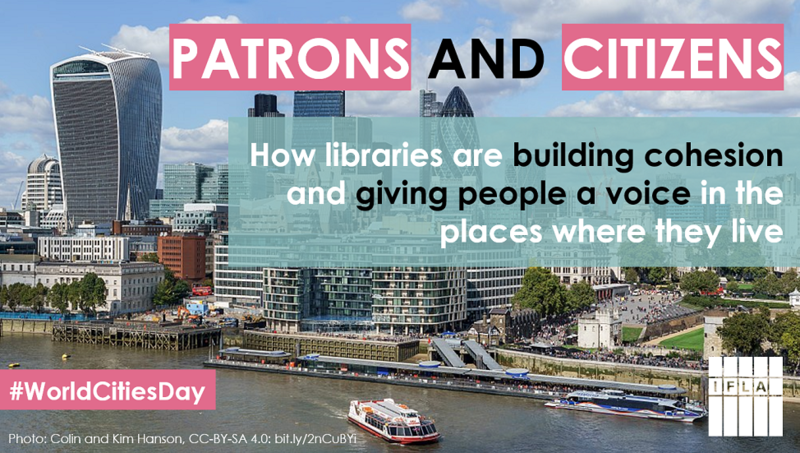 For World Cities Day, we’re therefore looking at how libraries form a key part of the social civic architecture of the villages, towns and cities they serve. Clearly the recent work of Eric Klinenberg has drawn a lot of attention to this as a subject, so in this piece, we’re drawing on examples presented at IFLA’s World Library and Information Congress over the past few years. One of the striking conclusions from the work on attitudes to public libraries carried out by OCLC earlier this year was a sense of the growing recognition of how libraries help communities rather than just individuals. While there was less of a sense of the importance of individual services – Internet access, books, quiet areas – there was a jump in the numbers who felt that libraries provided an important space for the community. In the case of the Learning Labs hosted by some US libraries, they become a place where you make connections with mentors and peers. This move towards collaborative, social working is also apparent outside of the United States. In Croatia, the Fran Galovic public library organised collaborative projects involving different age groups, resulting a stronger sense of belonging to the community. In Brazil, park libraries established in some of the most violent areas of Rio de Janeiro, through providing spaces and support, helped deliver stronger community cohesion, in particular for young people. The focus on youth at risk of dropping out of the community is also clear in examples from Finland. Even as libraries help build communities through giving them spaces to meeting and work together, they also have a role in building the knowledge and confidence necessary to engage in civic discussions. Clearly the structures in place in any given country have a major effect, but around the world, libraries can support meaningful involvement in political life. A first step is through traditional information provision. Libraries, aware of their role, are making efforts however to design their offer in a way that works best for users. Zimbabwean libraries have experimented with ways to share information about debates in parliament. There are further examples in our article on the role of libraries in promoting democracy. Makerere University Library in Uganda partners with schools to support civic literacy programming. Meanwhile in Taiwan, libraries helped people to understand the new Cross-Straits Services Trade Agreement with mainland China in order to form their own views. And in Chile, the Library of Congress understood that the process of defining a new constitution required a concerted effort to educate the population so that they could make their voice heard. Libraries can, of course, also be active in civic life in defence of their users and the services they rely on. Hungarian libraries joined the ‘checked umbrella’ movement – the Civic Platform for Public Education – in order to advocate for properly supported schools and school libraries. This collaboration can be a source of strength of course, as seen in efforts in Nigeria to build alliances to influence and deliver policies for development. Civic engagement is not just about knowledge – skills are also necessary. Civic literacy is taught in the library in Seixal, Portugal, where a mixture of information about how government works, and the promotion of reflection on questions around rights and values serves to build informed, critical citizens. This is not necessarily an easy task, especially in countries where governments, for a long time, repressed civic engagement as a source of potential resistance. For example in the countries affected by the Arab Spring, there is recognition that libraries have the possibility – and the responsibility – to promote civic engagement as a means of making a success of democracy (where this has taken root). The importance of libraries as platforms for civic engagement was also on the agenda at a discussion organised by the Technology and Social Change Group at the University of Washington, which brought together people involved in civic engagement projects, and offers valuable lessons for others looking to realise libraries’ potential in this area. Historically, libraries have often been a source of civic pride, a local landmark. As the examples show above, however, it is as much what goes on inside the building as the building itself that can build the communities that make for stronger, more resilient cities. Happy World Cities Day! Clearly, libraries need to break old patterns and get new ways to get involved with the community. Easy to say it, but it takes a lot of effort to achieve it. Nevertheless, I believe that great oportunities are waiting around the corner and we, as librarians, have the “possibility – and the responsibility” to take them. Thanks for the links too.